JK Rowling’s first novel for adults is as far removed from Harry Potter as you can get. There’s not a wizard or magic spell in sight. Set firmly in the world of humans, The Casual Vacancy reveals the ugly side of a cast of characters living in a fictitious English town. Essentially, it’s a book about not-very-nice people being horrible to each other. It’s also a story about attitudes towards people who are less fortunate than ourselves. The novel begins with the death of Pagford parish councillor, Barry Fairbrother. Barry’s death leaves a vacancy in the local council, calling into question the fate of a local housing trust estate and the families living within it. 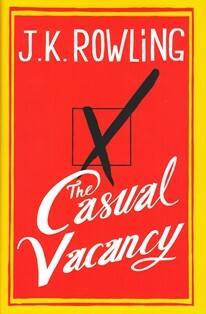 The Casual Vacancy has received mixed reviews. However, despite my dislike of many of the characters, I really enjoyed this book. “We discuss the poor as this faceless, lumpen mass…. “I was one of those people. I know how it feels to be talked about in that way….You lose your individuality. Knowing what Rowling was trying to achieve gave me a greater appreciation for her book. I also admired her ability to inject humour into a sobering story without detracting from her message. Rowling has a skill for creating characters with personalities that jump off the page and I liked the way she revealed the inner workings of their minds. Some were so grotesque as to be quite comical. At times I didn’t know whether to laugh or cry. Your review is beautiful! I really struggled to write something that made sense because I was a little overwhelmed. The conclusion brings it all together. Everyone has to face their prejudices and reflect on their behavior for the majority of the novel. But you also realize that the Fields are an essential part of Pagford. The pace really killed the novel in the first half, but I found myself unable to put it down after page 250. The work stands alone and proves that Rowling is a hugely talented writer. Glad we picked this one for the read along! Thank you! Glad you enjoyed the book too. Cheers.